they are eligible to apply for this WBBPE Tet 2017 Exam. Candidates who are having the necessary qualifications they can apply online for this WBBPE TET 2017 Exam through the WBBPE official website of West Bengal PBE @www.wbbpe.org. Online applications link for this WBBPE Teacher Eligibility Test 2017 will active from 15-11-2017 and will closed on 30-11-2017. Approximately there are 15000 Class 1 to 5 teachers vacancy is available in WB Elementary Schools. Candidates may choose the first language form the given language details and second language is English for all in this WBBPE TET 2017 Exam. WBBPE TET 2017 Exam will be conducted as per the Norms of NCERT only. Teacher Eligibility Test will be conducted in Single Day only. Written Exam will be conducted for 150 Marks only for this Elementary School Teachers Eligibility Test 2017. This time online applications are only accepted for this WBBPE Teachers Eligibility Test 2017. OR Diploma in Special Education. Those who are studying the final years of above said posts they are also eligible for attending the WBBPE TET 2017. There is no age limit for attending the TET 2017 examination. For details you can visit the official website of WB Board of Primary Educations @wbbpe.org. Application fee for WB TET 2017 is Rs.100/- for General/OBC and for Rs.25 for SC/ST and pwd candidates. Written exam consists of one paper only. Exam will be conducted for 150 Marks. 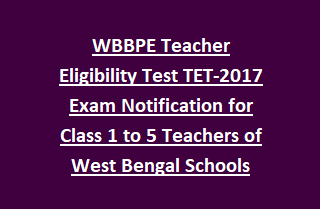 Total 5 Different sections will be given in this WBBPE TET 2017 for Elementary Teachers Eligibility Test. Each section consists of 30 questions. Total exam will be conducted for 150 Marks. For general candidates qualifying marks are 60% and for all other reserved candidates qualifying marks are 55%. Interested candidates can apply online for this WBTET 2017 from 15-11-2017 to 30-11-2017 through www.wbbpe.org website. Pay the application fee as per given instructions. Admit Card is also available in the same website just before 10 days of the WBTET 2017 Exam Date.